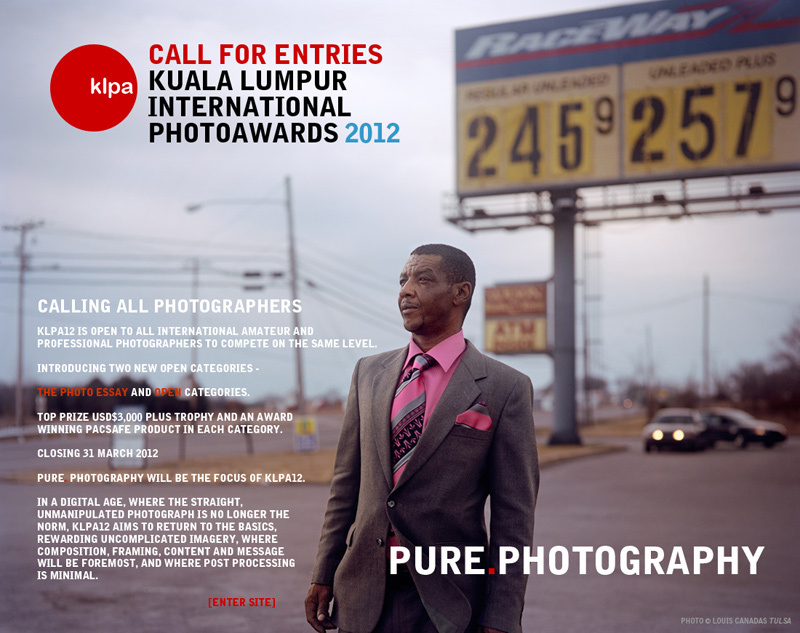 KLPA is an annual portrait photography competition, now in its 4th consecutive year. Open to all levels of international photographers in 3 categories- Portraits, The Photo-Essay, Open. Top finalists and winners will be selected by a jury of 5 judges from the arts and photography industry. Top cash prize of USD$3,000. Pacsafe products and a specially commissioned trophy will be awarded to first and second winners from each category. Submissions open 1 to 31 March 2012. Closes 31 March 2012. Special sponsor Select Awards prizes from Pacsafe, Anti-Slavery International and FotoVisura.com. KLPA 2012 will culminate in an Awards Evening in Kuala Lumpur in June where all the main prize winners will be invited to attend a presentation ceremony. A public exhibition will run in conjunction. Please visit the main website to register your participation and to receive notifications. KLPA is supported by Time Out Kuala Lumpur & MAP KL and is organised by explorenation.net and KL Photoawards Malaysia.